Summers at my grandparent’s house always meant trips to the store owned by Mr. Lovell Brooks near their home in the cotton mill village. In the front of the store, to the right of the door as you entered, was a chest-type freezer where Mr. Brooks kept ice creams. We weren’t allowed to pick out an ice cream every time we were in the store, but we certainly maximized each opportunity we had. I never had to think about my selection. I went straight for a Creamsicle: vanilla ice cream on a stick with an orange sherbet coating. 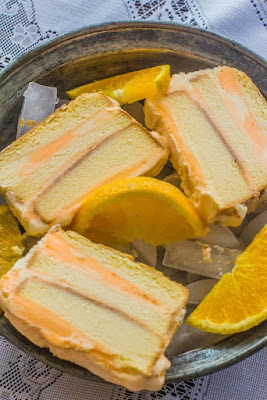 To share this childhood favorite flavor with my grandchildren, I whipped up a Creamsicle-Inspired Ice Cream Layer Cake during one of their visits. It’s not like I went to any trouble to do this, either. I purchased a frozen pound cake loaf, orange sherbet and vanilla ice cream. This is a fine example of a lazy day dessert. A mighty fine example. It requires very little thinking on your part. You need to use a few brain cells and remember to make this in enough time to allow for it to firm up before serving, but that’s about all the thinking and planning required. I don’t know what attracted me to Creamsicles in the first place. Maybe it’s the orange sherbet part. Remember Push-ups? They’re orange sherbet in a small cylinder shaped container and you push it up from the bottom as you eat the sherbet. That was always my selection on ice cream day at school. You can switch up the sherbet and ice creams flavors anyway you choose. Of course, it wouldn’t be Creamsicle-inspired if you go that route. However, it will be YOU inspired and that’s even better. The inspiration for this treat is one of my favorite childhood ice creams on a stick called Creamsicle. It is vanilla ice cream coated with orange sherbet. Using a store-bought frozen pound cake along with vanilla ice cream and orange sherbet, this frozen treat is no-fuss. The hardest part is waiting for it to firm up in the freezer. Remove pound cake from pan. Slice lengthwise into three layers. I didn't have trouble slicing it frozen. If it's too hard for you, let it sit out just a few minutes and try again. Place a piece of wax paper in the pan with about 4 inches excess on both long sides of the pan. Return one layer of cake to the pan. Dot with dollops of sherbet and ice cream. Swirl. Repeat with remaining two layers of pound cake, sherbet and ice cream. Cover the top of the finished cake with wax paper. Freeze until firm.